Today I actually uttered the phrase "hold the phone." I love my adopted home state of Alaska, but sometimes its little oddities still surprise me. Like the fact that the mayor of Talkeetna is a cat. Yes, you read that right. A cat. 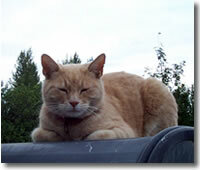 His name is Mr. Stubbs, he's an orange tabby with a stub of a tail (hence the name) and he rules over Talkeetna, population 860. ﻿If you're not familiar with the odd but wonderful town of Talkeetna, it is the usual jumping-off point to climb Denali, a/k/a Mt. McKinley--though if you call it McKinley, Alaskans will know you're not from here. Personally, I think he's got a lot of gravitas. I've seen less likable politicians. With the state of politics these days, this seems a most sensible decision. What?!? I freaking love Alaska. This is perfectly silly and just perfect. Thank you for putting a smile on my face!! LOL!! LOVE that a cat is the mayor of the town! Probably a lot less problems! This is hilarious. Seriously, only in Alaska! That's awesome! I had no idea that was possible...I'm not sure if I should be thrilled or worried! I don't exactly know how it is possible, either--maybe Talkeetna isn't incorporated? I found a website that suggested it had to be done by special election because no human wanted the job. I love this story. And, I agree---Mr. Stubbs is probably wiser and more dignified than most! Considering the current crop of presidential hopefuls, I'd be perfectly willing to consider Mr. Stubbs!